The weather is frigid and this cold weather id difficult for so many on our city’s streets. 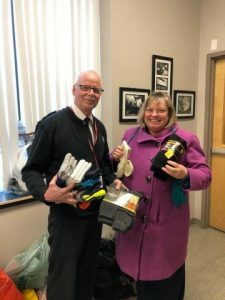 The Rotary Club of Hamilton’s January Service Project is Socks & Jocks. We are collecting socks, underwear, gloves & hats to donate to the Salvation Army. President Nancy Baker delivered over 400 items to the Salvation Army’s Dan Miller on January 17th. This was the first delivery of Socks & Jocks to keep people warm in Hamilton. The project continues for the entire month. Another example of the difference Rotarians make in our local community! Service Above Self!